Spider-Gwen #34 Reveals Gwen Stacy’s Biggest Challenge Yet! New York, NY—April 13, 2018—Gwen Stacy’s adventures on the alternate universe of Earth-65 have included battling against Matt Murdock as Kingpin, being bitten by the Venom symbiote, and teaming up with fellow webslinger warriors Silk and Spider-Woman. 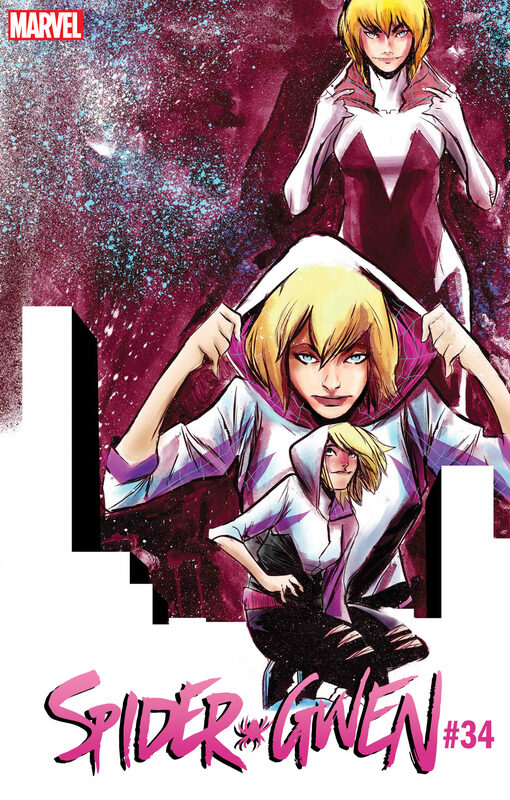 Now, in SPIDER-GWEN #34, Gwen’s going to have to face her biggest battle yet – and she’ll have to do it without a mask or a secret identity! All the epic adventure, all the crazy crossovers – it’s all been leading to this. Don’t miss SPIDER-GWEN #34, in comic shops this July!